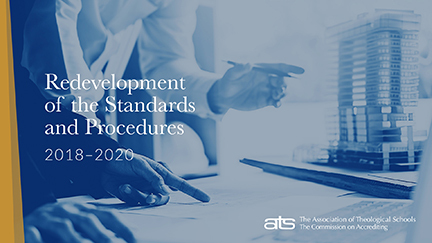 As previously mentioned, the Association of Theological Schools (ATS) is currently engaging in a comprehensive redevelopment of its accrediting Standards and Procedures. The current timeline for the redevelopment envisions a two-year process (June 2018 to June 2020), with regular membership involvement throughout the process. The first year (2018-2019) is called “a year of listening, researching, and reflecting” during which time the Task Force will intentionally engage a wide variety of audiences. The first engagement is next month’s webinar. In June 2018 the membership of the Association of Theological Schools (ATS) voted to authorize a two-year comprehensive redevelopment of its accreditation standards and procedures. In this webinar, Debbie Creamer–a former library director who currently serves as senior director of accreditation at ATS–will provide an overview of the redevelopment process and will introduce participants to the ways in which they can be involved in ATS’s “year of listening, researching, and reflecting” prior to the development of new standards. The session will share some of what has been heard so far and will discuss some of the themes and directions that are emerging. The webinar will include time for Q&A and will explore additional ways to share updates and gather feedback from ATLA members.